The Brolga is a very unusual bird of Australia; the bird was originally named the “Australian Crane” back in the 1800’s by an artist John Gould. I don’t know why the name was changed. 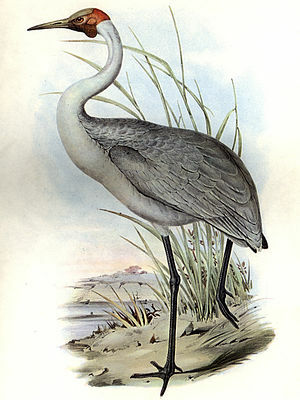 The Brolga is a wetlands bird and is very common, although in the Southern States for some reason the numbers are not so good. What makes this bird so unusual is its dancing ritual which it uses for mating as well as protecting its bit of ground, which you will see in the video below. 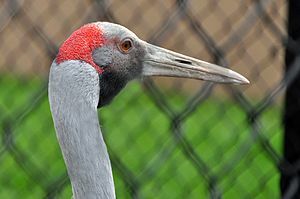 The Brolga is a very pretty pearl grey or silver grey, in colour and is part of the crane family, it grows up to 1.3 meters or 4.3 feet in height, it has a wing span up to 2.4 meters or 7.9 feet, their weight is around 3.7 to 8.7 kg or 8.1 to 19.2 pounds. The male weights slightly more than the female. The Brolga has a very pretty wide red band around their neck; the young birds do not have this band it is developed later as they become adults. Another unusual aspect of this bird is its mating season. It doesn’t actually have one, mating depends solely on rainfall, so depending on which part of Australia the bird is in mating is from February to May or September to December for the Southern States. The nest is built by both male and female, and is a raised mound built with sticks, uprooted grass, mud etc. and is always located in wetlands in shallow water or occasional floating. The famous dance begins with a bird picking up some grass and tossing it into the air, catching it in its bill, and then progresses to jumping a metre into the air with outstretched wings, then stretching, bowing, walking, calling, and bobbing its head. Sometimes just one Brolga dances for its mate; often they dance in pairs; and sometimes a whole group of about a dozen dances together, lining up roughly opposite each other before starting. I found a great article about this bird if you would like to learn more in ABC Science. 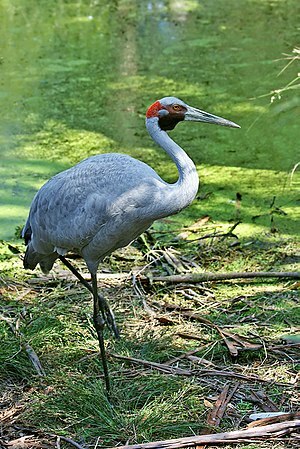 This entry was posted in Animals, Australia and tagged Bird, Brolga. Bookmark the permalink. Thank you for sharing Mag! This reminds me of our sandhill cranes here in Florida. Love the birds! Most of the birds in the crane family are beautiful birds and graceful as well. I always learn something new when I visit your site Mags! Beautiful bird. They are a beautiful bird, I love that little splash of red around their neck. Yes, so soon I saw the Brolga I thought of our cranes – they come in hundreds to one special lake in Sweden and people all over the country come and watch them dance. I love the way their necks go up and down and the sound they make. It’s so amazing how every species is programmed differently. It’s really so divine. I love wildlife, especially birds, this one so beautiful! Thanks for sharing mags! So interesting to read and watch Mags. I was hoping it would catch you by surprise. A brogli . . . what? Such beautiful, graceful birds. Thanks for sharing them with us, Mags. Nice footage, fun facts! I was in Alsace-Lorraine when I saw two storks dancing in unison on a rooftop. It was fascinating! Thanks for sharing. Very graceful bird … loved that dance! Interesting, I’d never heard about it before. We have these great blue herons here and when they fly over, they resemble teradactyls – or at least what I interpret them to look like. Amazing birds. I have seen photos of the Blue Herons, they are a magnificent looking bird, if I remember correctly they have slanted type of feathers, and also a large wing span, although I don’t remember the size. always l see something new when I visit your site This is beautiful and very interesting blog.Thanks for sharing them with us, Mags. They are such beautiful, graceful birds; I haven’t heard of them before Mags, so thanks for the info and the great video of them dancing! Another educational blog, Magsx2! Thank you! A couple things that occurred to me watching the video: the Brolga’s head makes it look like it might have crossed with a turkey at one time; if I had a pet Brolga, I’d name it Olga – Olga the Brolga; I think it’s funny how crane “knees” bend in the opposite direction of ours!. 🙂 Also, the references to the paper cranes reminded me of an artist I once met, Judy Dunn, who makes polymer cranes. The first link is to her multi-colored cranes, and the 2nd shows photos of a project she started to make cranes, each with the name of a soldier killed in Iraq (I can’t find anything else about the project, so I’m guessing she may not have got the funding that she needed to complete it). I loved Judy Dunn site, magnificent Origami Cranes, done in clay too, very nice. It does seem like she ran out of funds for the project which would of been huge, a great idea doing them in wax paper they would certainly last a long time. I remember doing a bit of origami as a child, but not much, but for those that have a gift for it, like the ones in your link, just fantastic pieces of art. From the description it sounds a lot like a crane, but once I saw the head up close, I am pretty sure the name was changed because it may not contain all the genetic factors needed. It’s a bit like a ballet in a way. Elegant, amazing birds! The word brolga is a version of the native name for the bird, so it’s considered more authentic. Compare how the country that for the first part of my life was called Rhodesia (named by the British for a Briton) went back to being Zimbabwe after independence from the British. Thank You also for visiting and taking the time to comment. Isn’t Brolga it’s Aboriginal name? I always thought that it was. Once men learn that dancing is an essential mating ritual, they might start doing more of it. Keep showing them, Mags! Very neat to see this! They look very much like the Sandhill Crane we have here!